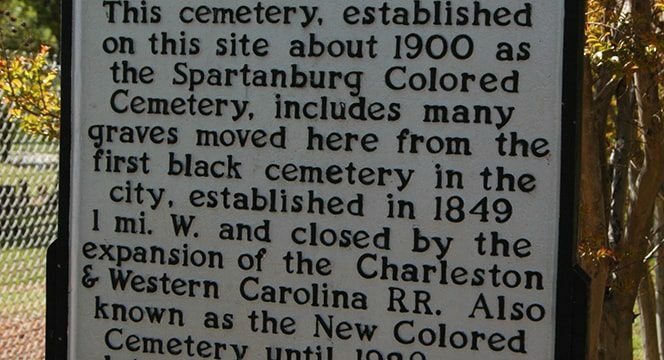 This cemetery, established on this site about 1900 as the Spartanburg Colored Cemetery, includes many graves moved here from the first black cemetery in the city, established in 1849 1 mi. W. and closed by the expansion of the Charleston & Western Carolina RR. 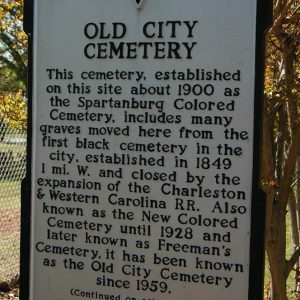 Also known as the New Colored Cemetery until 1928 and later known as Freeman’s Cemetery, it has been known as the Old City Cemetery since 1959. Prominent persons buried here include educator Mary Honor Farrow Wright (1862-1946), for whom Mary Wright School was named, midwife Phyllis Goins (1860-1945), policeman Tobe Hartwell (d. 1932), for whom city housing developments were named, city councilman Thomas Bomar (1864-1904), and educator Annie Wright McWhirter (1885-1976), the first woman to teach at the South Carolina School for the Deaf and Blind.